First, don't leave your gear where anybody can get to it and nobody is watching it. I play at a church, and when I started playing there, I was told a story about how the pastor had left a 12-string Ovation in the sanctuary, and one day found that it had left him forever. See message at the top of the post. When I play, I plug my Tele into a Roland GT-6. Very portable, and I port it when I go. This year, we recruited a third guitarist (fourth if you count the worship pastor, who plays guitar and sings, and we've since found a fifth), and he has a big pedalboard, a DI connection to his mic'd tube amp in the rafters, and since he has a tour-ready case for his pedalboard, he tended to leave his pedalboard at church. And he lost two pedals, including a ZVex Fuzz Factory. He started carrying his gear home after that. This is spring. I watch the local musical instruments feed on craigsist, because every so often there's a pedal or something I can afford, and I saw a Fuzz Factory, and I start thinking "ZVex has unique paint jobs for their pedals. Maybe the third guitarist can recognize his pedal", and I pass it on. He, in turn, has someone call and ask about it. I don't know who the culprit is, and I don't know what happened to him (hey, guitar gear theft; I might be stereotyping, but it trends male to me) but I do know the third guitarists got his pedals back. This is my #1 Tele, in the middle of a string change. Mid-song, I popped the high E off the set of D'Addario .009s they put on at GearFest at Sweetwater. I think that five months is pretty good for a set of strings. Thing is, I had one set of Ernie Ball Slinkys (.010s) and four sets of Extra Slinkys (.008) in my gear bag, so I couldn't really just go back and grab one string. I took my advice and worked through it, and when I got done playing, I got ready for next time and switched sets to an .008 set. I'm trying out B.B. King's advice to Billy Gibbons, that you don't need to work that hard. I tried .008s before and liked them, so I'll go again. I need to keep a string winder in the gear bag. I thought I did, but I don't. They're cheap. I need to keep a tuner in the gear bag. I pulled one onto my phone, and it worked, but it would be better to plug it into the guitar. I think I need a spare guitar. My #2 is in desperate need for a level, crown and polish, and that could work, but there's a guitar at the guitar shop that I desperately love. While I don't like the guy's potty mouth, I do like his very sitar-like fretless Tele. Don't let the video title fool you, it isn't a Fender guitar, much less Fender Custom Shop guitar. Plus, Yakkety Sax. So, what's all this compression about anyway? Just Nick explains it, using his wonderful seafoam green Telecaster. "You Were Probably Going To Mod It Anyway"
So, I was on TDPRI, looking around, and someone posted that he was thinking about getting an Esquire. An Esquire is in essence a Telecaster with no neck pickup. It was wired with three setting: a bassy setting to cover the the low-end (not really a common position), a standard volume-and-tone setting, and one where you bypass the tone knob and go right to the jack. This is a bit of a hot-rod wiring. My suggestion was to get a Squier Classic Vibe '50s Tele and mod it, because TDPRI is all over these things as being very good early Tele repros for not much money, so you can get solid standard hardware and change what you want. Sweetwater created the FENDER® Sweet-Mod Classic Vibe '50s Telecaster® to give you a hot-rodded Fender experience right out of the case. We start with the tried-and-true Fender Classic Vibe '50s Telecaster®, supercharged with DiMarzio Area T stacked humbucking pickups for big, fat, aggressive tone. You get the iconic look and feel of the Classic Vibe '50s Telecaster, with a seriously upgraded sound courtesy of Sweetwater's factory-authorized guitar workshop. You were probably going to do these modifications anyway, and our expert guitar techs have already done the work - for less than your local guitar tech would likely charge. 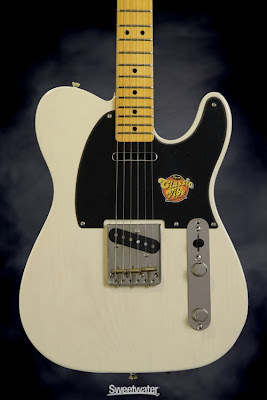 No other retailer has the Fender Sweet-Mod Classic Vibe '50s Telecaster, and it's made to pack an amazing sonic punch. "You were probably going to do it anyway." There's a number of different choices. 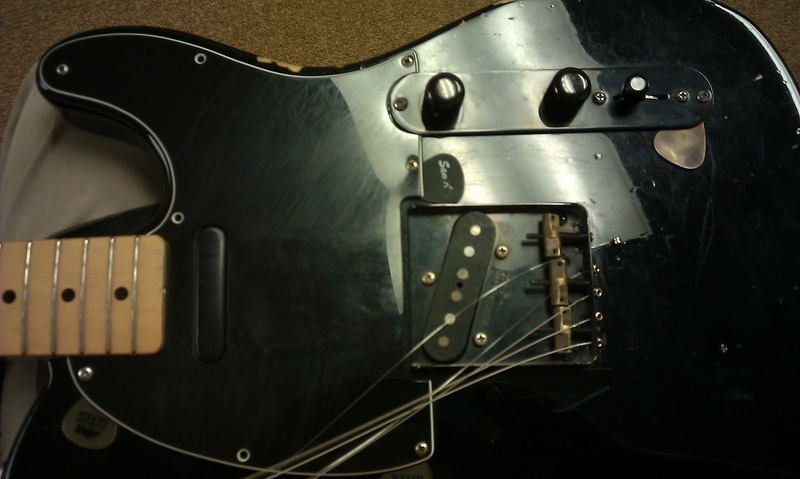 Teles get either Fender Noiseless or DiMarzio Area Ts. (Stratoblogster can tell you the Strat options. That's his job!) No Esquire options (because you'd have to swap out the pickguard, too, I think). I must say, I'm wanting. Scotty Anderson is easily the best guitarist you haven't heard of. Or, maybe you have heard of him. Lucky you, then. This is taken from Arlen Roth's old Hot Licks video series, which included two great mindbenders from Danny Gatton. I've wanted to get a Fernandes Sustainer or similar unit in my guitar for a while, just so I could do that sort of thing. This is a big reason why I want a Moog guitar or lap steel, too. Or, at least an eBow. For the record, those are still on my wish list, too, but from the looks of things, if I had a Fender Runaway, it could do most of what I'd want all that for. I'm not sure how it works, but it seems like a variant of compression and likely to want to be at the front of my pedal chain, toward the right side (not just because of the way guitar pedals go, but also because I'm right-footed and would rather have wah, volume and this right next to each other in front of my right foot, no matter what way things are wired. These aren't in stores yet, as far as I can tell, but I'm waiting with decreasing patience for them to show. iowa91 is a picker from just outside Paris (and not Paris, Texas), and she certainly has some licks down. 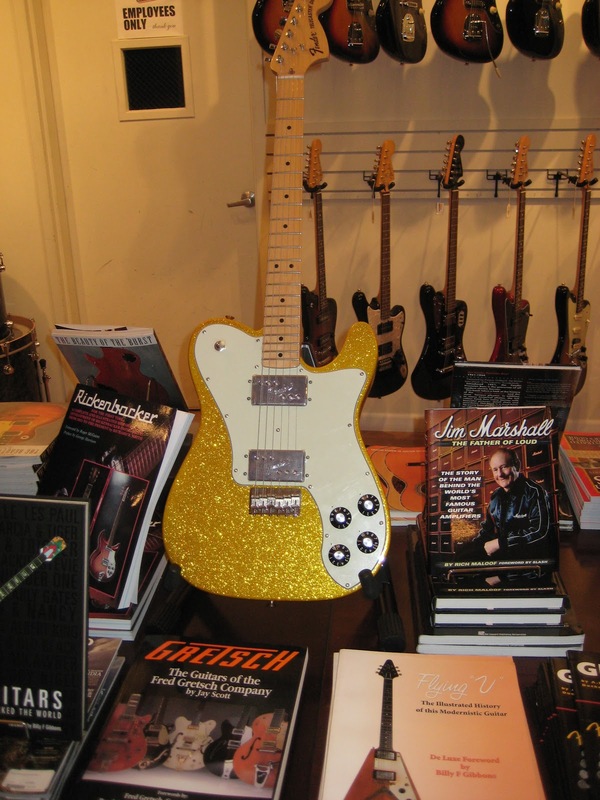 This is a Fender FSR Classic Series '72Telecaster Deluxe in Vegas Flake, as seen in Chicago Music Exchange. It wanted to come home with me, but alas, it had to stay. They also have a Supro 8-string lap steel that's a dead ringer for my 6-string (on the table in this post). And a James Trussart SteelCaster in rasta colors and a number of surprisingly affordable Squier Jazzmasters which don't seem to be on the site. And the B-Bender, and an FSR Black Paisley Tele, and so many others. Chicago Music Exchange is one of the cooler guitar stores I've ever been in. There's further religious and philosophical connections to all this, but as a quick and dirty definition, praise songs are the fast songs and worship songs are the slow ones. And this week, the two praise songs have intros that, when I showed up at practice on Tuesday, I didn't know. Song 1, "You Are Good"
I don't have the time -- I do, but in my hands, not in my head -- but here's the tab. Song 2, "Reaching For YOu"
I don't have this one remotely as together as the other, which is somewhat ironic, as the other song was assigned to another guitarist, who has stopped showing up to practices. Again, my attempt, with repeated noted cut. Rather than try to do the tab, I think I'll just link in this other vid. So, I'll try got get together what this guy has totally together, by Sunday. three - la - la - laaAAARRRGGG! I am not Danny Gatton. But this song is in Eb and I've played it once before, it's in waltz time not 4/4, while "Tequila" is (I'm fairly sure) in a more guitar-friendly key and I am fairly sure that Danny played that song regularly since it was new, and if he had problems in the studio but nailed it when it counted, what more can I ask? On the reference tape for one of the songs we did Sunday, there's a melodic bit that starts sounding very mandolin, and in practice I brought my mandolin to play the bit, and switch to guitar. The timing is such that the verse is over and it's time for me to play again that quickly. There is not much time after I hit the volume pedal for me to get into the mindset of guitar. I handled it reasonably well in practice on Tuesday. I flubbed it badly in soundcheck/warmup on Sunday. I did it poorly during first service. I did it better but still not well during second service. But I don't have one. I think I'll put one on my Christmas list. But the lesson is, if you have a tricky part or transition, practice it. The more you practice it, the more it gets in your hand and not in your mind. It is helpful to be able to think through things on the fly, but use that to handle it when the unexpected happens, not get through the expected. First, let's start with this: I've been thinking I needed to dream up something to say here. I never thought it would be anything like this. I saw a link on Facebook today, of Eric Skye doing a solo fingerstyle arrangement of "All Blues". Let's be clear: Miles Davis' Kind of Blue is one of my favorites, and "All Blues" is one of my favorites from Kind of Blue. Beyond that, I've been wanting to get a smaller bodied guitar because I want something less boomy and more punchy than my dreadnought. I love it. I need to listen to the real take, not just the discussion. Plus, I need this or at least this, but that's not really actionable today. What is actionable is pulling up versions on Spotify and putting them into your queue. This included one with Larry Carlton and Steve Lukather from No Substitutions, Live in Osaka. Ever have something rub you the wrong way? It did me, and I tweeted about it. Listening to Larry Carton and Steve Lukather take on All Blues. I like guitars w/ gain. I like jazz. I don't like said guitars in jazz. A justifiable position, if a throw-away position. Re-listening to the track on Spotify, I'm finding it far less objectionable. And it's a tone issue, not a playing issue. Clearly, both are top players. Here's some Larry and Steve from YouTube, but not the same track. This lead to a discussion with friend-of-the-blog and fellow Clarence White fan Adios Lounge (@adioslounge), basically ending with the thought that Western Swing and Redneck Jazz are great. We hold these truthes as self-evident. That is the greatest of ease, isn't it? But it doesn't stop there. Because, I follow Steve Lukather on Twitter, so he was able to find this conversation and reply via DM, which I won't quote because I can't link to it. In the 20th century, you harsh on music you have problems with to your friends near you. At the turn of the century, you harsh on and discuss music you have problems with to your friends around the world. In the 21st century, the person you harsh on, a person who played on one of the first albums you ever bought, responds to you. Plus an echo box, doing "Run Like Hell"
Jim Campilongo, "The Prettiest Girl In New York"
Man, if that isn't Chet Atkins meets Roy Buchanan, I don't know what is. The man will teach it to you, too. And, coming in at the 6-minute mark with the guy with the camera-phone not knowing where to look, the amazing Tony MacAlpine. All going through Hendrix' great song, "Little Wing".